Lately it seems like Singapore's weather is controlled by a toggle switch between 'extremely hot' and 'heavy downpour'. While the rain spells may provide some much needed relief to the excruciatingly high temperature we are exposed to almost daily, it makes driving much more stress-inducing than it already is. With these pointers, you can be certain that driving in the rain is not as nerve-wrecking as you would imagine. Aqua what? Aquaplaning, you may recall this word from your driving lessons. It happens when water builds up between the road and your vehicle's tyres, it results in a temporary severe loss of traction, and your vehicle will barely respond to steering input. You can think of it as the tyres floating above that thin layer of water on the surface of the road. To prevent it from happening, it is important to understand that we have to maximise the ability for the tyres to cut through water. For starters, having tyres with ample tread depth would greatly reduce the likelihood for aquaplane to occur, as the deep grooves are able to displace the water effectively. 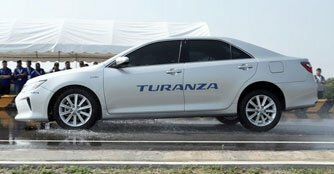 By driving at a slower speed and avoiding puddles and standing water which tend to accumulate on the extreme lane of the road, you will also be able to greatly reduce the tendency for aquaplaning to occur. When your car aquaplanes, the steering will feel 'light', your engine's RPM may suddenly increase (much like stepping on the clutch while you are accelerating), and your car may feel 'floaty' and unstable as well. Even though your instincts may tell you to slam on the brakes and slow the car down immediately, that is the exact opposite of what you should do. 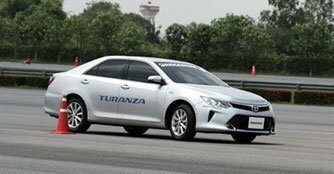 Any sudden steering input or harsh braking will definitely end up with you facing the wrong side of the road or even wrecking your car. That's why you need to suppress that nagging urge to overreact. 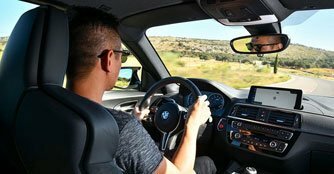 What you should do instead, is to avoid any sudden, excessive braking or steering input, which will upset your car's balance and cause you to lose control. 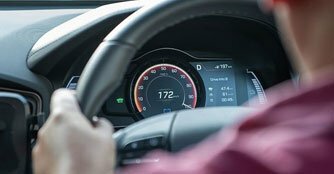 You should keep your steering steady, towards the direction you want the car to go and gradually release your accelerator to allow the car to regain traction. If you have to brake, take note to regulate your braking and prepare for any instability. The fact that slick tyres used by race cars are outlawed on the streets around the world shows us how important the grooves and tread pattern on tyres are. On a dry road, these grooves doesn't do much other than generate more noise, in the rain, however, is where they really shine. Think of them as drainage ducts, the grooves on a tyre disperse water on the road so that most of the rubber remain in contact with the road surface and provide that traction your car needs to stay on the road. 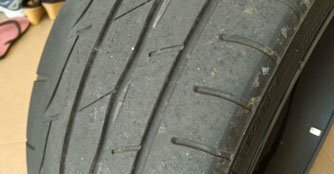 Worn tyres with much lesser tread depth and shallower grooves will not be able to channel water off effectively and thus has a detrimental effect on the tyres' wet weather performance. Increased stopping distance, substantially reduced traction in the wet and aquaplaning are a few adverse by-products of bald tyres. Running on bald tyres? Head over to our product listings and get some fresh ones now! Not only does heavy rain reduce visibility, the layer of water on the road also acts as a lubricant, reducing your vehicle's traction. Lower visibility often results in a longer reaction time for the driver, while the wet slippery road also means the vehicle will not be performing as well as it would on a dry surface. This highlights the importance of keeping a further following distance and driving at a lower speed to give others and yourself ample space and time to react to the road condition. While driving slower in the rain makes it safer, slowing to a crawl could potentially disrupt the traffic flow, making it even more dangerous. Imagine driving in the rain on the expressway and a car pulls out in front of you, going extremely slowly, you slam on your brakes but your car wouldn't stop. Now, do you see how driving way too slowly can be a serious problem? With the much shorter distance that you can see due to rain, any abrupt lane changing or braking will be treacherous as others may panic and fail to react promptly, resulting in an accident. Rapid acceleration, braking or sudden steering movements can also cause you to lose control of your vehicle on the wet roads as the tyres may slide on the slippery road surface. A large part of driving safely in the rain lies in remaining calm and patient, avoid any abrupt or drastic movement that other drivers and their vehicles wouldn't be able to react to in time. Also, give some thought to the two-wheelers who share the road with us, whose vehicles are much more susceptible to the adverse effect of the wet weather, and everyone will be able to stay safe in the rain. 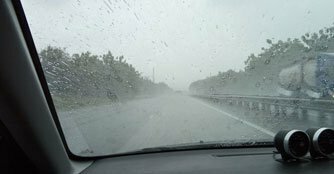 Whether it is in broad daylight or darkness of the night, a heavy downpour will undoubtedly obscure your vision of the road and other vehicles, reducing visibility tremendously. While switching on your car's head and tail lights may not seem to do anthing to improve your visibility on a rainy day, what it does, is that it makes your vehicle much more prominent on the road, allowing other drivers to notice you. A road filled with 'phantom cars' that you cannot see easily would definitely make accidents much harder to avoid. Imagine driving in a sea of fog and heavy rain, not being able to notice the presence of other unilluminated vehicles until they are way too close for comfort. That will definitely make driving in the rain a much more daunting task than it already is. By now, we have reiterated countless times that rain will obscure your vision, and explained how it affects your driving. 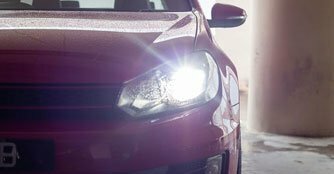 If you have experienced it first-hand, you will know how the sunlight reflecting through the rain drops and water spray from other cars can reduce the vision out of your windscreen into a blur of white. There is, however, one obscure trick to seeing better in the rain, and that is to wear polarised sunglasses. As ridiculous as it may sound, there's actually a good reason for it to work. Polarised lens block out the glare from light reflected off smooth surfaces such as water or the bonnet of your car. Similarly, light that is reflected by the rain droplets can be blocked by the polarised lens in the same manner, improving your vision when driving in the rain. Enjoy a peace of mind when driving in the rain. Search for the cheapest insurer and get up to 25% discount on your insurance renewal today! Drink Driving Is An Act Of Irresponsibility!